Tabcha, or Ein Sheva, is a site on the north-west shore of the Sea of Galilee. 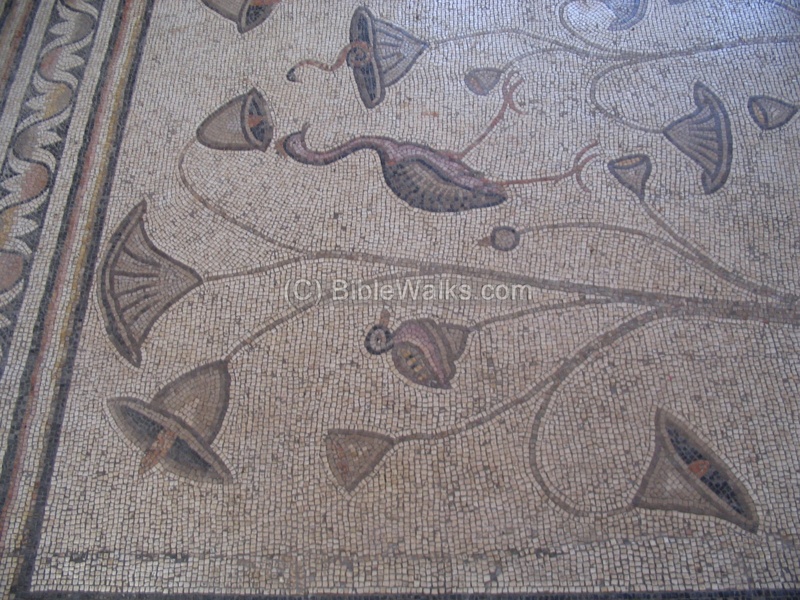 In this site there is the Church of the first feeding of the Multitude, with beautiful mosaics of an old church, including the two fish and basket - the symbols of the miracle. Tabcha (Ein Sheva) is a place in the north-west section of the Sea of Galilee which is blessed by seven springs. The area of Tabcha (Ein Sheva) was one of the best places in the Sea of Galilee for fishing. Some of the seven springs are warm sulfuric springs, such as Ein-Nur and Ein-Ayub (Job's spring). This caused the fish to gather here, especially in the cold winter months, and so were an easy catch for the fishermen. The waters from the springs were delivered to the fields and villages around using aqueducts. Near the springs there are pools that were used to raise the level of the water in order to deliver them via the aqueducts. The waters were also used for powering water based bread mills. The last bread mill worked here until 1948.
first feeding of the multitude: feeding 5000 with 5 loaves of bread and two fish (Mathew 14: 13-21; Mark 6: 30-44; John 6: 1-15). The area is located at the north-west corner of the Sea of Galilee, on the side of the ancient road from Tiberias to Damascus. The seven springs was the west side of territory of the Roman village of Capernaum (Kefar Nachum in Hebrew), which is about 4KM away to the east. This is the aerial view of the area from the south side. Tabcha is located to the east of the ancient site of Tell Kinneret. Pointing on purple points will automatically scroll to the relevant photo, text or web page. 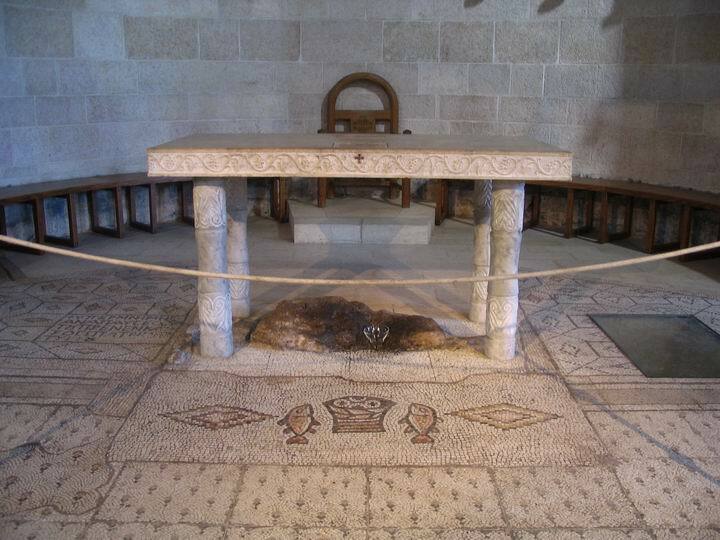 the earlier one (from 350AD) -its remnants can be seen on the right side of the altar below the glass cover. the later church (450 AD) was built towards the exact east, unlike the earlier church. Over many years the mosaic floor was laid out (there is an inscription in the floor dated about 480AD). The Persian invasion (614AD) destroyed the site, which was in ruins until 1932 when the site has been excavated. 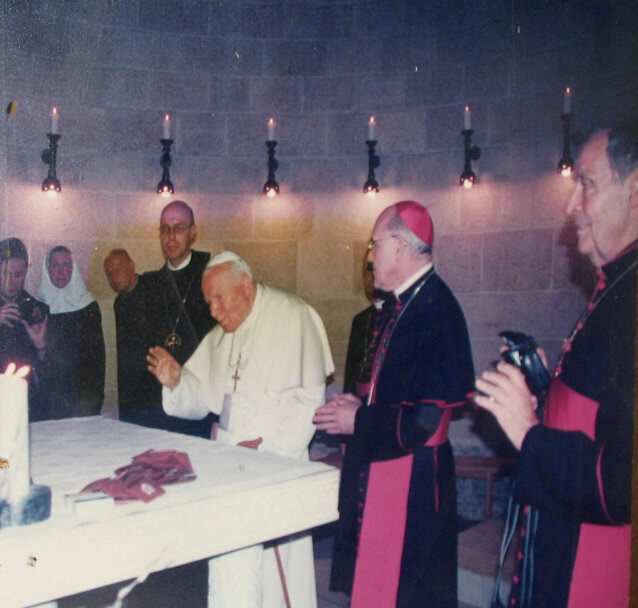 In 1982 the new Church was built around the old Churches, preserving the beauty and simplicity of the design, and glorifying the mosaic floor - one of the most impressive in the Holy Land. The following photo shows the front of the Church of the first Feeding of the Multitude at Tabcha. Its size is 33 x 56M, and it houses the two ancient churches. After passing an inner garden, then passing the inner Church doors, this is the view of the interior. 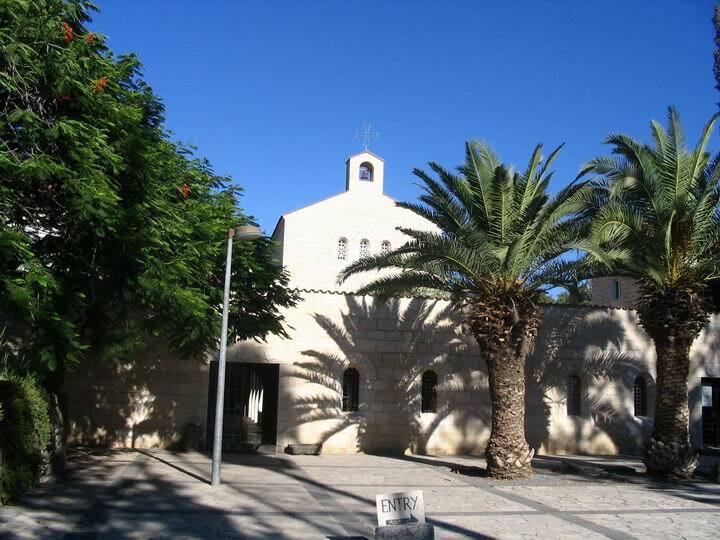 The size of the inner church is 19M x 25M, and it is built over the floor of the ancient church from the 4th C AD. Under the raised altar was the foundations of the oldered Church from the 3rd C AD. Most of the floor of the church is covered with the 4th C AD mosaics, based on stones of 1x1 cm in different colors. In the front, under the altar, is a rock. 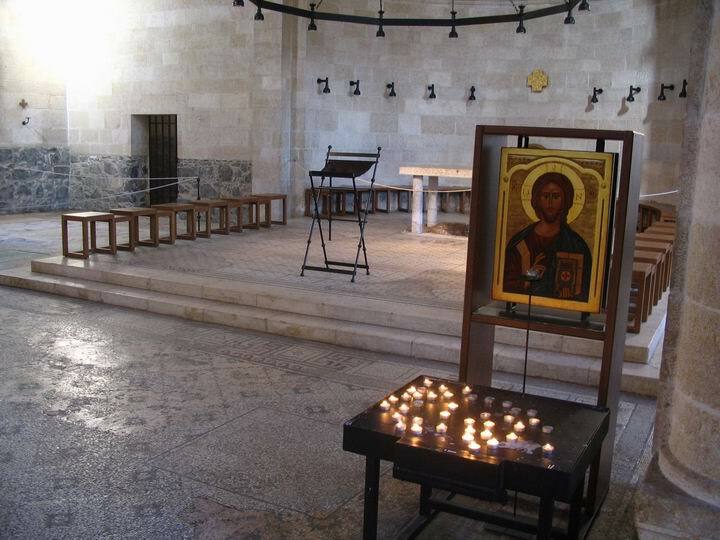 This rock is believed to be the place on which Jesus laid the loaves. The old church was actually built around this rock. 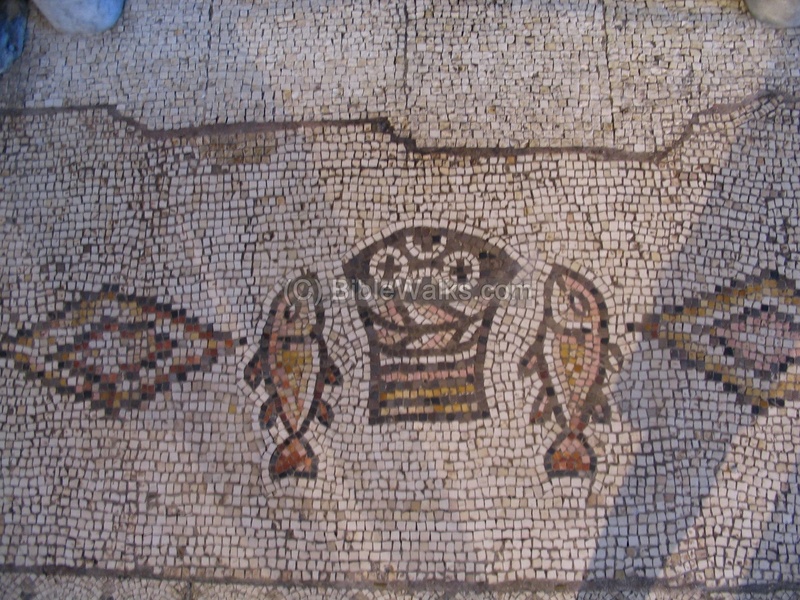 Before the rock - the beautiful mosaic illustrating the two fish and basket with loaves (for details of that section - press here). At the right of the altar is a glass protecting cover; under it lay the remnants of the foundations of the older ancient church (from 3rd C AD). At the left of the altar is an inscription of Patriarch Martyrios of Jerusalem (479-486) which is mentioned as the founder. Another detail of the mosaic floor is seen below. Most of the objects are water plants and water birds, scenes that are typical of the swamps of north-east area of the Sea of Galilee and Chula lake. The artist used the local scenery as the theme of the floor. You can drive from Tiberias (7KM to the north). 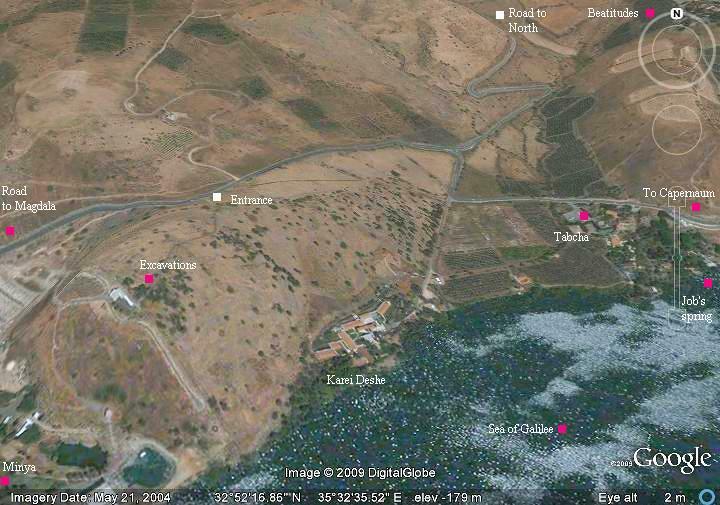 The site is located just after the large water pump facility in the north of the sea of Galilee. 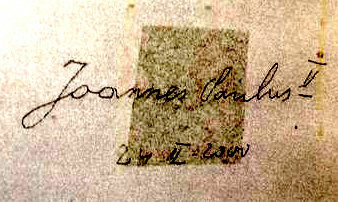 The late Joannes Paulus II visited here in March 24, 2000, as part of his Millennium visit. "When Jesus heard of it, he departed thence by ship into a desert place apart: and when the people had heard thereof, they followed him on foot out of the cities. And Jesus went forth, and saw a great multitude, and was moved with compassion toward them, and he healed their sick. 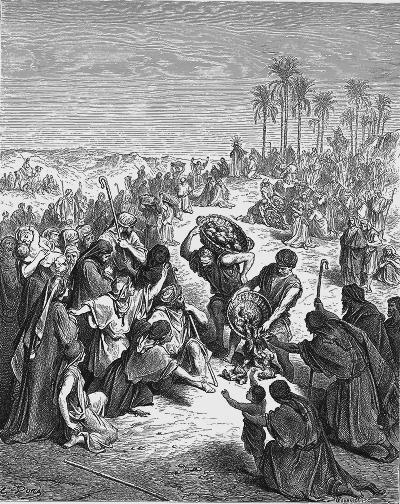 And when it was evening, his disciples came to him, saying, This is a desert place, and the time is now past; send the multitude away, that they may go into the villages, and buy themselves victuals. But Jesus said unto them, They need not depart; give ye them to eat. And they say unto him, We have here but five loaves, and two fishes. He said, Bring them hither to me. And he commanded the multitude to sit down on the grass, and took the five loaves, and the two fishes, and looking up to heaven, he blessed, and brake, and gave the loaves to his disciples, and the disciples to the multitude. And they did all eat, and were filled: and they took up of the fragments that remained twelve baskets full. And they that had eaten were about five thousand men, beside women and children". Tabcha - from Arabic. The origin of the word is in Greek: Hepta-pegon, which means "seven springs". In this area there are 7 springs, hence the name. Another theory attributes the number 7 to good luck, as in Beer-Sheba (the seven wells). Ein Sheva - the name of the site in Hebrew, which means seven (Sheva, Sheba) springs (Ein). Capernaum - from Hebrew: Kefar (village) + Nachum (a name of the prophet from the old testament). 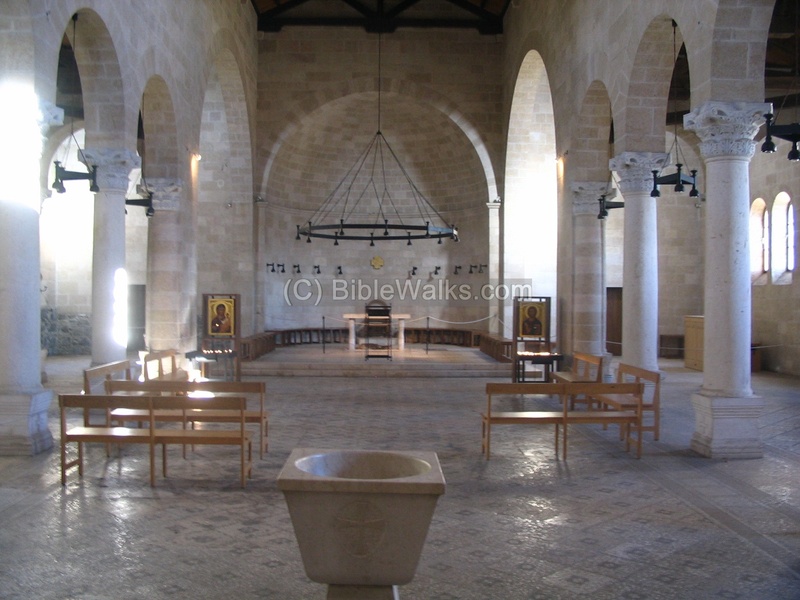 Footsteps of Jesus - This pictorial presentation is arranged by BibleWalks staff.